Ontario Council of University Libraries has made available information on the impact of the cancellation of the mandatory long-form census and the current process in Parliament to reinstate it for 2016.
n July 2010, OCUL joined many concerned organizations and individuals in Canada in objecting to the government of Canada’s decision to cancel the mandatory long-form questionnaire as part of the 2011 Census of Population. OCUL represents 21 Ontario university libraries with more than 450,000 students and faculty across the province. In addition, we provide support to researchers from municipalities, provincial and territorial governments, NGO’s, social and cultural associations, as well as private sector marketing and business firms and organizations. The OCUL Data Community is a community of data professionals with expertise and interests in the use of all forms of data, including the Canadian census. The information presented here has been prepared to identify the impact of the cancellation of the mandatory long-form census and ensure that researchers have a full understanding of the current situation. Preserving and ensuring ongoing access to cultural heritage, government records and information by the public, through the stewardship of national libraries and archives and other public heritage institutions. The full text of the Declaration is available here. Please share widely. What is the Idea Dialogue? 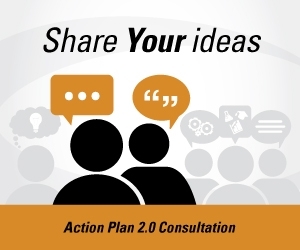 It is a way to take the next step in building Canada’s Action Plan on Open Government 2.0. We’d like you to share your ideas on ways the Government of Canada could focus its efforts toward increased openness and transparency. You could also help build on someone else’s idea by adding your comments on the idea details discussion pages. Canada’s first Action Plan on Open Government helped us make significant strides in providing easier access to the data and information Canadians want. This could be a great opportunity for the government information community to make concrete suggestions for improving access to government information and data in Canada. Please, contribute your recommendations to this consultation, spread the word, and upvote the ideas you support! En quoi consiste le dialogue en matière d’idées? Il s’agit d’un moyen de passer à l’étape suivante dans l’élaboration du Plan d’action du Canada pour un gouvernement ouvert 2.0. Nous aimerions connaître vos idées sur la façon dont le gouvernement du Canada pourrait orienter ses efforts en vue d’accroître son ouverture et sa transparence. Vous pourriez également enrichir l’idée d’une autre personne en ajoutant vos commentaires aux pages de discussion relatives aux détails de l’idée en question. Le premier Plan d’action du Canada pour un gouvernement ouvert nous a aidé à réaliser d’importants progrès qui ont permis de faciliter l’accès des Canadiens à l’information. The Government of Canada has introduced a new expenditure management system as part of an ongoing commitment to sound management of government spending. The new system is focused on managing results and on the ongoing assessment of all direct program spending, or strategic review, to ensure efficiency, effectiveness and value for money. Library and Archives Canada’s (LAC) strategic review concluded that the Canadian Book Exchange Centre (CBEC) program was not appropriately aligned with the priorities of Canadians and with core federal responsibilities. LAC has come to the conclusion that it can no longer financially support the operations of CBEC. Consequently, effective immediately, CBEC will no longer accept publications from the private sector or from government and international organizations for redistribution among libraries. CBEC will shut its doors permanently effective June 30, 2008. LAC recognizes that many libraries appreciated the services provided by CBEC. However, a review of the Centre’s activities showed a very high discard rate since many of the materials received were either in poor condition or did not fit the donation guidelines. It also confirmed that the amount of materials received and distributed has been steadily declining in recent years. Given the context, it was difficult to justify maintaining CBEC’s operation. LAC’s decision also reflects the trend in libraries towards online materials, including e-publications and periodicals that are becoming increasingly available. To ensure the best possible use of the materials in inventory, libraries will continue to have access to the existing collection until June 30, 2008. Details will be announced shortly. LAC continues to support and contribute to resource sharing activities both at a national and international level. Furthermore, the savings and realignment opportunities that LAC has identified through the strategic reviews will be reinvested in higher-priority programs related to core federal government business. LAC will work with the federal library community over the coming months to put mechanisms in place which will facilitate the disposal of their surplus publications. A letter will be sent to the senior officials responsible for information management in federal departments and agencies.